We have officially completed 50 “dives” in the hyperbaric chamber. It feels great! Thank you, once again, to so many of you who helped make it possible for us to do these treatments each day. We are seeing results!!!! And it’s exciting!! Here is a list of some of the progress we’ve noticed since beginning the oxygen treatments. * More energy. Not only does Judah seem to have more energy; but Chad and I feel more energized after our 90-minute sessions in the chamber. With that energy has come a better mood. He seems happier and is adjusting better to his surroundings and to position changes. * Judah’s babbling more. He’s making new sounds and new inflections in his voice. AND he’s imitating our sounds!! * He’s interacting more! He reaches for our faces and playfully interacts with us. What’s even more exciting is seeing him interact with others outside of our family. 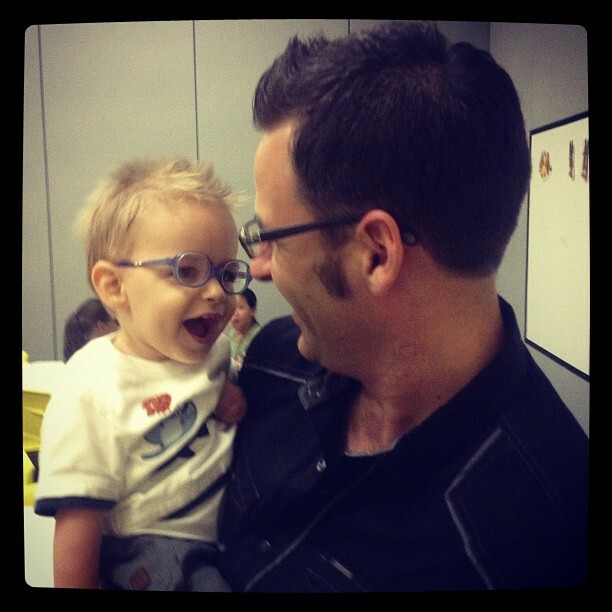 Yesterday during vision therapy Judah was hilarious… and he knew it! He was in such a playful mood – it brought joy to all of us. * His left side continues to show more movement. He’s kicking with his left leg. His left arm is loosening up. And he’s doing a better job grasping objects with his left hand. * Judah likes toys! We’ve waited so long for Judah to play with toys. He has had a couple of favorite toys in the past; but lately he’s become more curious. Yesterday he was exploring a new toy – he’d pass it from hand to hand, then lift it up in front of his eyes to look at it. YAY!! * Judah can roll either way from tummy to back. And can now roll from his back to tummy! * He’s tolerating tummy-time much better! It’s fun seeing him realize that it isn’t so bad after all! Thank you for your continued prayers. And thank you for all of the encouragement you bring to our family. We are thankful for each and every one of you. It’s exciting to see all these improvements! I am so happy that you have been able to 1) get the HBOT chamber, and 2) that you had the faith to put Judah in it enough times to see results. Yes, OXYGEN is amazing. One of those FREEBIES which has God created for Man, besides rain and sun. God Bless you all; thank you for posting; it am thrilled for you!